Board of Elections fundraising reports were due in Raleigh yesterday, and there was at least one bombshell discovery: Attorney General and presumptive Democratic gubernatorial candidate Roy Cooper is out-raising sitting governor and presumptive screw-up Pat McCrory ... by a good country mile. "We're Just Now Getting Started!" There's a bumper-sticker for you! 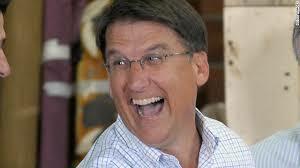 "Doing his full-time job as governor of North Carolina." How's that working for you? Your own party's leaders in the General Assembly obviously regard you ... well, they scarcely regard you at all, and when they do, it's less than complimentary. This will up the right-wing pressure on what's-his-name -- Dan Forest, our divinely inspired lieutenant governor -- to run a primary against McCrory, though that in itself would be a fool's errand. In other words, how can Dan Forest resist the temptation? Governor McCrory is laughing manically at what he sees over his right shoulder, but that rising tide is gaining on him and is no laughing matter.